The Jouberts farmed with dried fruit and grapes delivered to Barrydale Cooperative Cellar. It was Beate and Meyer Joubert’s vision, after working two seasons in the Napa Valley at different cellars (Cakebread, Sutterhome and Mondavi amongst others doing their internship), to start their own brand named Joubert-Tradauw, focusing on quality wines Boutique-style, thus being trendsetters in the Tradouw Valley, Little Karoo. Utilising the original spelling of Tradauw, the word is derived from a Khoisan phrase ‘Tarras Duo’ which means footpath of the Khoisan women, from when they would trade their goods at Witsand on the coast, merely 80km from the Tradouw Valley, but walking barefeet with their children. The R62 red Bourdeaux blend was their first trademark. The reason for this is that the historical highway R62, which is the original route from Cape Town to Port Elizabeth, cuts right through the four farms. This classic red commemorates both the spirit and dreams of the makers of the highway. Our wines are unfiltered, unrefined and partially naturally fermented as we strive to make wine that is truly natural and healthy; made in the vineyard so to speak. They were the first to acknowledge the R62 route as a trademark and compared it to Route66 from Chicago to Los Angeles as a tourist route. The Jouberts are also deciduous fruit producers and wine producers. The natural sweetness and flavour in the fruits make it sought after and highly recommended in the international market. 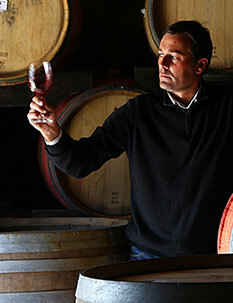 is a third generation Joubert, the family hails from Wellington originally. Wine is a family industry for Meyer, he grew up in a family of wine.